In this widget you can add your Google+, Twitter, Facebook and Feedburners ID so that your blog visitors can contact you easily. Also it has a subscribe email bar beside the social icons. The demo of this author box can be seen by clicking the below button. Now you have seen the demo follow the below steps to add this author box to your blog. NOTE : You may Find more than 1 <div class='post-footer-line post-footer-line-1'> so make sure that you are pasting under the right one. If the author box doesn't work paste the code, under the second tag. Once you have added the above code change text in Green with your desired Text / URL. Save the template. You are done now. You and your visitors can see cool author box widget under every post of your blog now. Thank you very much, awesome author box! This is not working on my blog!! The code <div class='post-footer-line post-footer-line-1'> occurs more than 1 time, make sure you have selected the right one. Thank you very much, is working on my blog. Its a very nice widget, I really liked it. But I don't know why it is not working on my website. I just don't want to lose it. Thank you so much.. I tried this widget in my blog: http://proweblabsww.blogspot.com. But it is not worked. I did not undertand; where will I put CSS codes in HTML? after "head" or below "head" tag? or after /also other HTML codes? after "div class='post-footer-line post-footer-line-1" or below "div class='post-footer-line post-footer-line-1"? please help me about fixing it.. Regards.. 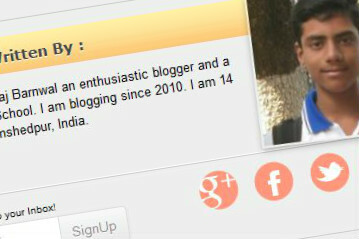 I don't think that Author box is required to show, if you are displaying every thing in about us section on your blog. On the other hand I agree it is the way to invite people directly to get connected with Author on his or her social profile. Although, I didn't try it, but it looks great... Thanks and keep sharing. This is really helpful for me. But I don't know why it is not working on my blog "www.mmblogchitthu.blogspot.com" . I add CSS and HTML follow your instruction. But this is not working. The end, I add your HTML codes to my blog footer Gadget :) . I change the text "This Post Was Written By:" to "This Blog Was Written By:" . This Gadget is work properly . Thank! All r giving positive comments but it is not working in my blog do not know why??????????? Hai, it's really cool author box.... how to make your cool bottom facebook like button? Look Like a Professional Blog. thanks for providing us this code.